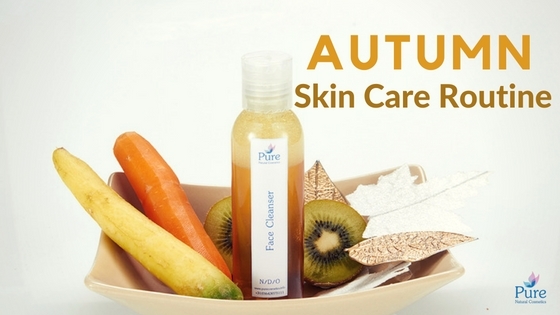 Adjust your skin care routine for fabulous fall skin! As the days are getting shorter, the temperatures drop and the air becomes drier, your skin may lose precious moisture . Autumn is a time for transition and the best autumn skin care routine will correct any summer damage that has occurred and prepare your skin for winter. Sun, chlorine and saltwater may have taken a toll on your skin throughout the summer so fall is the time to exfoliate and nourish your skin. Ditch the soap. Fragrant soapy scrubs might feel (and smell) wonderful after a day at the beach, but they leave your skin dry and irritated. When fall arrives, switch to a natural soap-free hydrating cleanser which will not only gently clean your face but as well will give it the moisture it needs. Exfoliate with a natural, gentle scrub. The summer sun and chlorine may have left your skin feeling dry and flaky. Start the new season off with a gentle scrub session. Oil and seaweed-based scrubs are wonderful because they exfoliate and hydrate. Switch from lotion to cream. As the air becomes drier, your skin needs a thicker moisturizer. Creams provide a stronger oily barrier, which means they both reduce water loss from the outer layer of skin and provide hydration to this layer of skin at the same time. Get yourself a rich, thicker day& night face cream . Protect your lips. Start moisturizing now to prevent dry, cracked lips this winter. Use a non-petroleum , natural lip balm for best results. Invest in hand cream. Hands often become dry and cracked during fall and winter. An ounce of prevention really is worth a pound of cure. Start moisturizing your hands now to ensure soft, supple hands all winter long. Pure’s “Winter edition hand lotion” will give your hands lots of moisture and will take good care of any dryness or cracks .